Officer Kim Donnell and Officer Jamie Fanning were eating dinner at our Northern Light Eastern Maine Medical Center, because cops like to live it up sometimes, when they were approached by a Mom ( I capitalize Mom for reasons every son should understand). Mom told Kim that her 9-year-old daughter loves police officers and wondered if she could take a photo of the lady cops to show her girl. Kim asked Mom to get into the picture as well, sent some of our coveted BPD Junior Police Officer badge stickers home with Mom and that was the end of that. 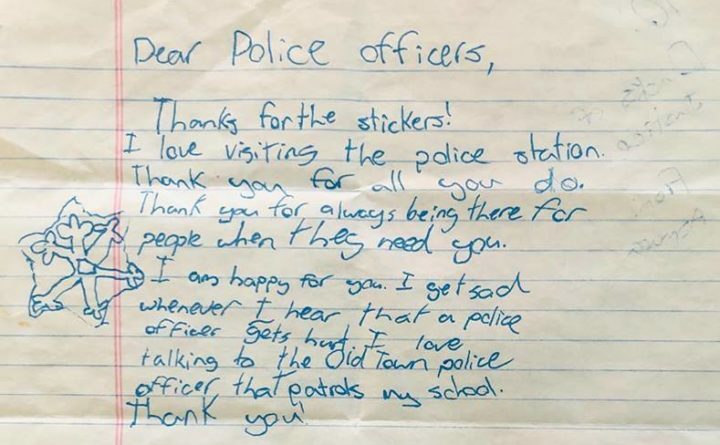 Kim ran into Mom a couple of nights later- Asmara had written a note in nifty blue ink- for the officers. Kim asked me to share it on the page. Mainly because she knows I scour our cop’s pages for cool little stories. I don’t share the posts directly for obvious reasons. Kim and Jamie setting an example for other young ladies who might want to join our ranks to try to make a difference in a community. We have some great female police officers here. Keep it in mind if you are a young, or not so young, woman looking for something new and interesting for your career. We will be waiting for Asmara’s application about 12 years from now. 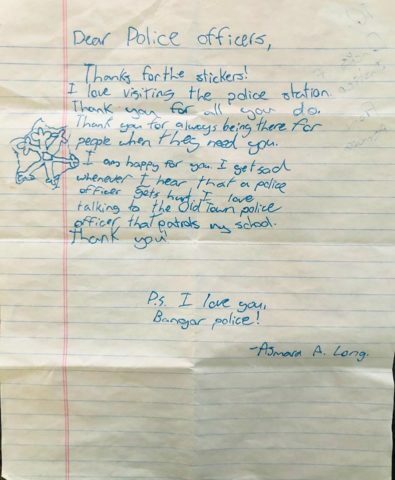 In a world where cops are patrolling hallways, some good must come out of it; there’s proof. Keep your hands to yourself, leave other people’s things alone and be kind to one another.